because we did an entire book about personalized German edged weapons I would like to introduce a dagger which not made it in the book here. The story is quite long, but hopefully its a good read and explains how interesting collecting can sometimes be. Imperial Naval daggers were bought by officers in a wide range of variations. We see daggers with Damascus blade in nearly every size, nickel plated and plain blades. 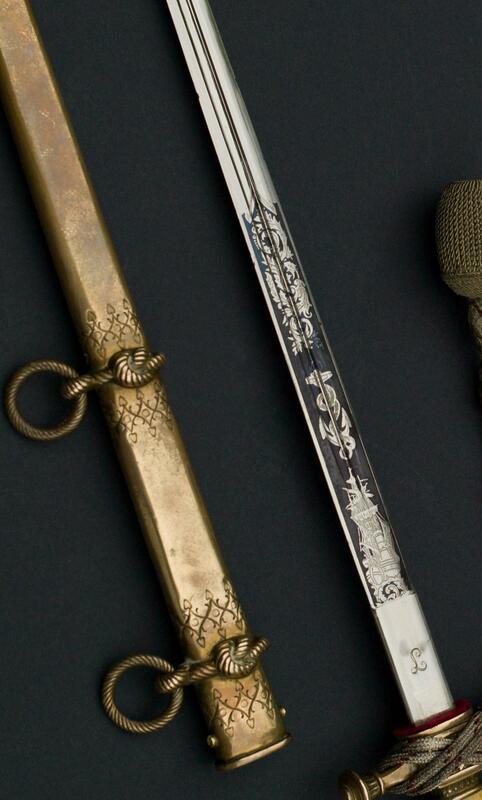 Nearly every navy-issued dagger for Cadets was named, but officer daggers with the open crown - purchased and selected personally by officers - are scarce. The likely reason is the fact that they were customized by the officer himself so that the risk of confounding them was low. In September 1901 a meeting of the German and Russian fleets was held in Danzig, with Emperor Wilhelm II and his cousin Tsar Nicholas II. During an evening dinner the German Kaiser, in acknowledgment of rendered services by the German maneuver units, allowed the Naval Officers Corps the re-introduction of the easy-to-wear dagger for marine officers. This also elegantly paid an indirect compliment to the Russian Tsar as all Russian naval officers carried a dagger; the Russian Navy was seen as an exemplary model for the German Navy. Correspondingly the Cabinet order for the re-introduction of navy officers’ daggers from September 13, 1901 was mentioned several times by the Russian Tsar. This was a noteworthy example, showing how a more-or-less simple military regulation was embedded in a diplomatic context. Regrettably, in his public appearances, the Kaiser lacked such diplomacy almost completely. 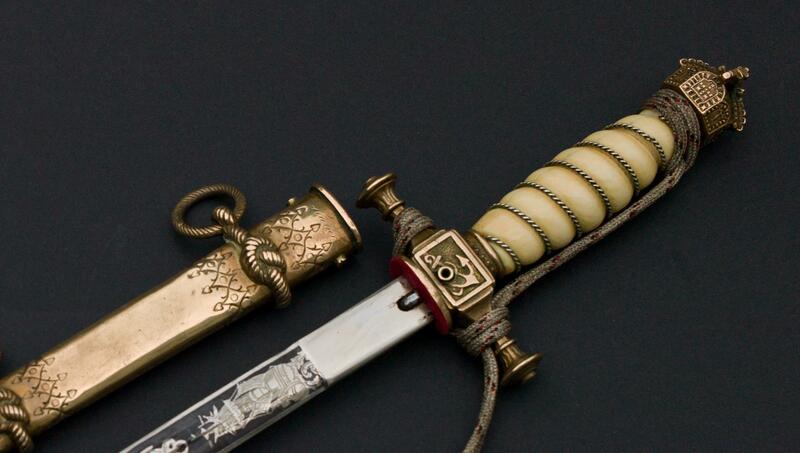 The prescribed dagger was virtually identical with that of the sea cadets but had an open crown and grip-wire around the hilt that gave a braided effect. Officers acquired their own equipment, also their own hand-weapons, so certain individualities arose and these were accepted. This was a reason why naval officers often chose short, easy-to-wear daggers decorated with various features of ornamentation and differing styles of blade. Sometimes the weapons remained simply as they were and only a dagger Portepée was attached around the hilt. Officers took pleasure in a certain freedom of choice regarding their personal weapons, and took advantage of this. The side-weapon of an officer was one of the very few possibilities where a measure of individuality could be achieved. Sea cadets were not allowed any kind of decoration with sayings or verse or other information on their weapons, only their name was permitted. The young men complied largely with this, and had their names engraved usually below the scabbard mouth on the fourth-facing side. Daggers of the 1890 pattern, with these personalizations have become extremely interesting for collectors and those fascinated by history. 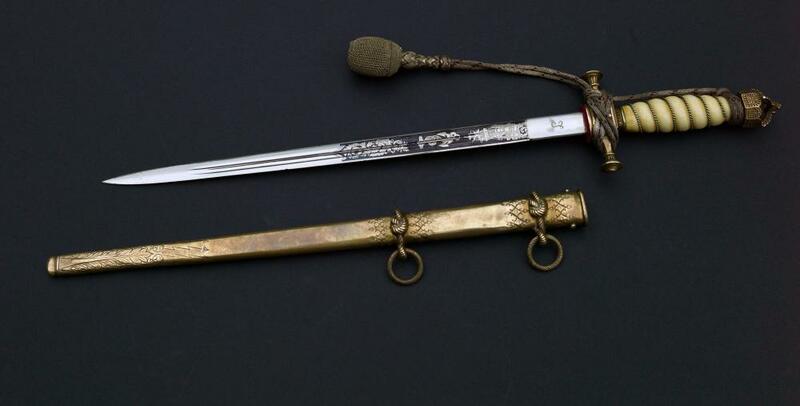 From the engravings, together with the complete and antiquarian ranking lists of the Imperial Navy, it is occasionally possible to classify the background of any bearer from any given dagger. A less restrained style of decoration was assigned to the often shorter dagger of the naval officers. We find dedications, names and quotations sometimes on the blade but they are also to be found on the scabbard. The occurrence of engraved names sometimes enables collectors and historians to trace the background of the weapon and above all reveal that of the bearer. This is regrettably often only possible when the bearer had an unusual or not too common name, even when in Imperial time naval ranking lists in such cases abbreviated first names. The type of dagger helps to give an estimation of the possible time period. The most important list for research is the so-called Honorary Naval Ranking list 1914-1918. In this, in 1930, all officers of the former Imperial Navy who did service in WW1 were entered with their rank, Honors, duties and capacities. This rather unwieldy, hefty tome can be purchased at some antiquarian bookshop; in the meantime however there are digitalized offers available. Much information, especially about well-known naval officers, can also be found on the internet. The dagger featured here is a 1901 pattern dagger as described in the regulation. The dagger has the same length as the 1890 pattern, but with an open crown pommel and a grip wire, as regulated for sea-officers. The blade is of a remarkable construction. Made of mono-steel, but nickel-plated and with a blued etching of naval motifs. The scabbard is ornamented with a hand-engraved decoration and the name of the former owner under the reverse scabbard mouth. 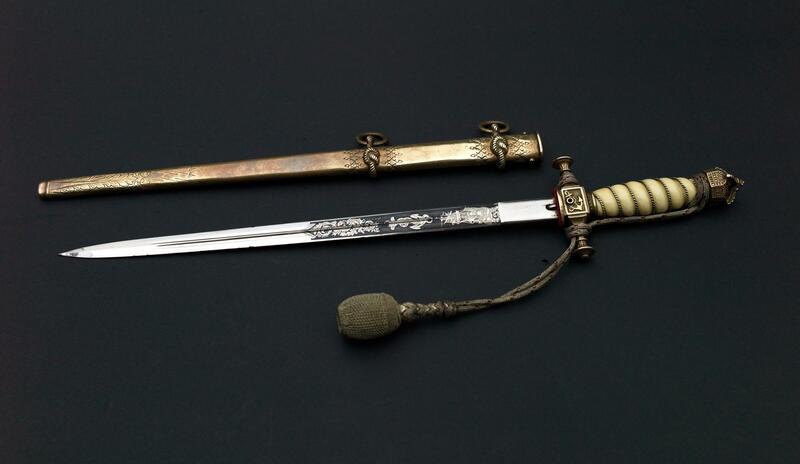 Most likely the dagger was made by the Carl Kaiser Company, which run out of business in 1905 and was one of the best manufacturers during the period. Kutter was born on April 25,1863 in Micklefield House at Rawdon near Bradford. His father was most likely also named William Kutter, but cannot be traced in the records of the large German community in 19th century Bradford. The father bought Micklefield House in an auction in the same year as young William was born. Williams’s sister was Valery Emily “Lorry” Kutter, she was the mother of Hans-Günther von Dincklage, a person we will hear about later. William entered the German Imperial Navy on April 23, 1878 as a Sea-Cadet. For one year we see him as a young Cadet on board of the “Niobe” school-ship and the Imperial Naval School in Kiel. Various temporary duties for training reasons on SMS “Renown”, “Friedrich Carl”, “Vineta” and “Mars” until 1882 when he was promoted to Second Lieutenant. In 1883 we see him on SMS Panzerschiff “Deutschland” and one year later in the 1st “Matrosen Division”, a navy infantry unit, as platoon commander. 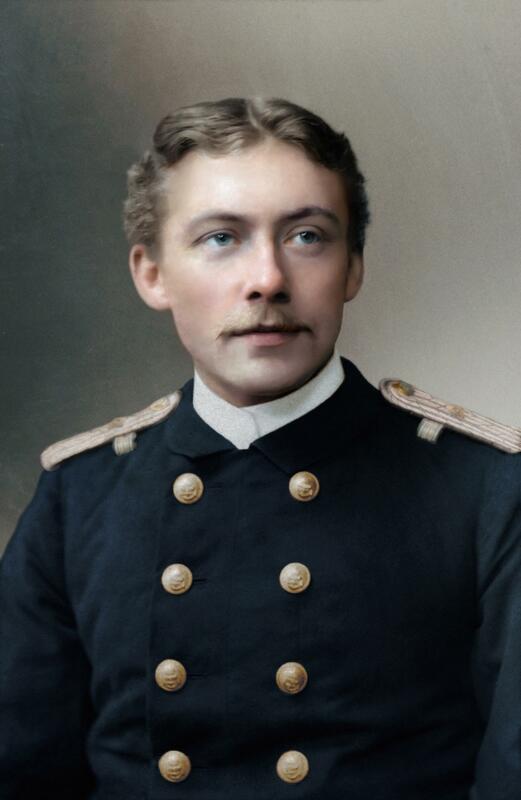 Promoted to Lieutenant in March 1885 he served on various ships as watch-officer. As Kapitänleutnant in July 1892 he served as watch-officer on the Panzerschiff “Bayern”. From July 1893 until 1894 he served at the Navy Academy and in 1895 on various ships again. The frequent change of commands for younger officers was part of the attempt to give the officers the possibility of a wide range of possible duties. From October 1895 until September 1898 he was transferred to the Torpedo-boats and commanded the ships “D-7”, “D-1” and “D-3”. In April 1899 he was promoted to the rank of Korvettenkapitän and served as First Officer on SMS “Kurfürst Friedrich Wilhelm”. The same year brought an interesting change in his daily duties. Because of the Second Boer War he travelled in October and November 1899 to the then German colony of Kamerun. He saw the first day of a new century under tropical skies as commander of SMS “Habicht”, a ship which was sent to the British Cape Colony because of tensions between Imperial Germany and Great Britain due to the Boer War. Luckily for the small German gunboat it came to no confrontation between Kutter’s ship and the British Navy so he travelled back to Germany from Duala during the turn of the year and reached his home country in early spring 1901. Between 1901 and 1907 he served as commander of SMS “Medusa”, “Schwaben”, “Weißenburg” and “Zähringen”, from 1904 as Kapitän zur See on. From October 1907 until his decommission in April 1904 he served as commander of the Imperial harbor near the city of Wilhelmshaven. Unfortunately it is not known what he did until the outbreak of the Great War, neither any rank list nor the official files of the German Bundesmarine having any information about this time period. However at August 2, in 1914 he was called to the arms and served until his new decommission in 1916 as commander of the “II. Baudivision” in the naval harbor of Wilhelmshaven, a unit responsible for testing new military ships. In the mid of January 1916 he was again decommissioned most likely because of his age and honorable promoted to the rank of rear admiral. Espionage in prewar France ? Interestingly we hear from him again in the 1930’s, a time with great tensions in Europe. Hans Günther von Dincklage was born in a noble German family. Handsome, well educated and with a remarkable military career, he fought with his father during the Great War on the Russian front, he was the perfect man to head the Abwehr mission at the Côte d’Azur in the area of the largest French naval base in Toulon. His retirement from the Army in 1929 was a cover up story invented by his commanders in Berlin. Dincklage swapped the cavalry uniform for an elegant civilian garb of a clandestine intelligence officer. His mother, Valery Emily “Lorry” Kutter was English born, Dincklage’s uncle was rear admiral William Kutter. It seems obvious that his uncle, a former commander of a German naval base, was more than helpful to learn about French military endeavors while watching the Toulon base at the beautiful and sunny French Riviera. Consequently a 1934 2eme Bureau report headed “Suspected Germans at Sanary” describes how Dincklage carried out operations in the South of France: “living in a number of villas at the Mediterranean resort village of Sanary-sur-Mer, 13 kilometers from Toulon; but settled in the Villa Petite Casa for many years”. Dincklage and his wife had an active social life befriended with their neighbors, including the English pacifist Aldous Huxley. One of Dincklages friends were French naval commissioner Charles Coton and his wife who described Sanary as a “small agreeable port filled with artists, writers, painters and sculptors”. He also mentioned the noise around Sanary that Dincklage was a German spy, but stated also “he never spoke to me about military matters”. Cotons remark was a pure lie. Later Coton’s spying was confirmed and he would become the von Dincklage courier, traveling between Toulon and Paris. A report of the Deuxieme Bureau confirmed that on Februar 9, 1935, Dincklage was visited by his seventy-two-year-old uncle William Kutter, a rear admiral of the German navy living at Darmstadt. Kutter arrived directly from Strasbourg (France) and remained in Sanary at La Petite Casa until the end of February 1935. The admiral was questioned at the Toulon rail station as to the reason for his visit. He told French agents he had come to Toulon as tourist, but he did not reveal he was going to the Dincklage villa at Sanary. From 1940 on Dincklage became famous as companion of Coco Chanel. He lived together with Coco in the Paris Ritz hotel, which was sized by German occupation troops and a preferred place of residence for upper-echelon German military staff. Both lived a luxurious life unbothered by the unpleasant events of wartime Paris. Dincklage, still member of the German Abwehr, was also responsible for Coco Chanel becoming a German spy. In late 2014, documents were declassified and released by French intelligence agencies confirming Coco Chanel's role with Nazi-Germany in World War II. Such documents identify Chanel as an agent in the German military intelligence. Chanel visited Madrid in 1943 to convince the British ambassador to Spain, friend to Winston Churchill, about a possible German surrender once the war was leaning towards an Ally victory. In 1943, Chanel travelled to the Reichssicherheitshauptamt in Berlin with her liaison and "old friend", von Dincklage. Chanel and Dincklage were to report to Walter Schellenberg at the Reich Main Security Office (Reichssicherheitshauptamt) with a ludicrous plan that Chanel had proposed to Dincklage: she, Coco Chanel, wants to meet British Prime Minister Winston Churchill and persuade him to negotiate with the Germans. In late-1943 or early-1944, Chanel and her SS superior, Schellenberg, who had a weakness for unconventional schemes, devised a plan to get Britain to consider a separate peace to be negotiated by the SS. When interrogated by British intelligence at war's end, Schellenberg maintained that Chanel was "a person who knew Churchill sufficiently to undertake political negotiations with him"
William Kutter’s nephew and Coco lived in the Ritz until the liberation of France when von Dincklage escaped to Lausanne in Switzerland followed by Coco Chanel shortly after the war. Kutter did not saw the disastrous end of the war, he died October 8, 1941 in the city of Darmstadt. A fascinating exposition, Flyingdutchman, and a wonderful dagger to accompany it!